Fleeing the screaming pandemonium he has just created; John Wilkes Booth flings himself over the wall of the Presidential Box at Ford's Theater. Behind him lies an unconscious and dying President Lincoln, a .50 caliber bullet lodged in his brain. As he plummets through the air, Booth catches his foot on the bunting decorating the front of the presidential box, loses his balance and crashes onto the stage floor below. Ignoring the pain from his broken left leg, Booth hobbles to his feet running to the back of the stage. The famous actor pauses at center stage to deliver his last line, "Sic Semper Tyrannis" (Thus always with tyrants). Booth then runs off into the night. A saddled horse waits in the alley behind the theater and Booth gallops to a bridge across the Anacostia River, the first point of a pre-planned escape route to the south. An Army sentry halts the assassin asking why he is riding so late. Booth explains he has been in Washington on an errand and had started late toward his home near Beantown. Inexplicably he volunteers his name, and that he is headed for southern Maryland, information that will shortly prove invaluable to his pursuers. Less than 10 minutes later, David Herold another conspirator in the plot to assassinate President Lincoln arrives at the bridge. Identifying himself as Smith, and giving his address as White Plains, Maryland, he convinces the sentry to let him pass. Shortly Herold catches up with Booth and the two head southeast to a roadside inn owned by Mary Surratt. At the inn the two fugitives collect some previously stashed supplies and Booth attempts to drown the throbbing pain of his leg with a bottle of whiskey. Booth can no longer ignore his pain. They ride to the house of Dr. Samuel Mudd, waking the doctor around 4 a.m. Mudd hesitantly lets them in and later testifies that even though he was acquainted with Booth, he did not recognize him as he set his leg. While the two weary fugitives sleep, Mudd makes his way to Bryestown to run some errands. The doctor is immediately confronted with the excited news that Lincoln has been shot and that the Army is searching for Booth. Hurriedly returning home, Mudd orders Booth and Herold off his property. They make their way through Zekiah Swamp with the help of a black tobacco farmer to the home of Samuel Cox, a Confederate sympathizer. Unwilling to let them stay, Cox directs them to a hiding place and sends for Thomas A. Jones, a Confederate agent. Knowing that Federal troops are scouring the area, Jones advises them to remain where they are--outdoors in a thicket of pine trees--until it is safe to cross the Potomac to Virginia. During their five-day wait, most of their accomplices in the assassination are rounded up. 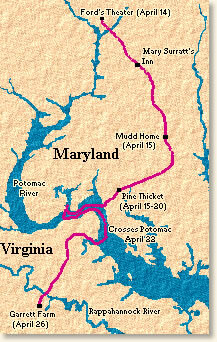 Failing in their first attempt, Booth and Herold finally make their way across the Potomac to Virginia on April 22. They expect a warm welcome. Instead they are grudgingly given food by various Virginians and told to move on. Aided by some Confederate soldiers, the two men find themselves at Richard Garrett's farm near Bowling Green. After riding and searching continuously for over 24 hours, the men of the 16th New York Cavalry arrive at the Garrett farm at 2 o'clock on the morning of April 26 and quickly discover Herold and Booth hiding in the barn. Ordered to give up, Herold flees the barn proclaiming his innocence. Booth defiantly remains inside, ignoring the threat to burn the barn if he does not surrender. As the officer in charge of the cavalry tries to negotiate with Booth, someone at the back of the barn lights some straw and fire spreads throughout the structure. Booth at first moves towards the fire, then turns and hops towards the door. A shot rings out fired by Sergeant Boston Corbett. Booth falls, paralyzed. Carried to the porch of the farmhouse, Lincoln's assassin lingers between life and death finally succumbing around seven in the morning. Booth's body is carried up the Potomac and buried beneath the floor of the penitentiary in Washington, DC. 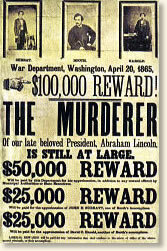 Sergeant Corbett is arrested and briefly held as a possible accomplice in Lincoln's death. David Herold stands trial with three other conspirators. All four are found guilty and all including Mrs. Surratt, owner of the tavern where Booth stopped, are hanged on July 7, 1865. "I dismounted, and knocked loudly at the front door. Old Mr. Garrett came out. I seized him, and asked him where the men were who had gone to the woods when the cavalry passed the previous afternoon. While I was speaking with him some of the men had entered the house to search it. Soon one of the soldiers sang out, 'O Lieutenant! I have a man here I found in the corn-crib.' It was young Garrett, and I demanded the whereabouts of the fugitives. He replied, 'In the barn.' Leaving a few men around the house, we proceeded in the direction of the barn, which we surrounded. I kicked on the door of the barn several times without receiving a reply. Meantime another son of the Garrett's had been captured. The barn was secured with a padlock, and young Garrett carried the key. I unlocked the door, and again summoned the inmates of the building to surrender. "I said, 'If you don't come out, I'll burn the building.' I directed a corporal to pile up some hay in a crack in the wall of the barn and set the building on fire. "I then motioned to the corporal to desist, and decided to wait for daylight and then to enter the barn by both doors and over power the assassins. "I told him I had not come to fight; that I had fifty men, and could take him. "At this moment Herold reached the door. I asked him to hand out his arms; he replied that he had none. I told him I knew exactly what weapons he had. Booth replied, 'I own all the arms, and may have to use them on you, gentlemen.' I then said to Herold, 'Let me see your hands.' He put them through the partly opened door and I seized him by the wrists. I handed him over to a non-commissioned officer. Just at this moment I heard a shot, and thought Booth had shot himself. Throwing open the door, I saw that the straw and hay behind Booth were on fire. He was half-turning towards it. "He had a crutch, and he held a carbine in his hand. I rushed into the burning barn, followed by my men, and as he was falling caught him under the arms and pulled him out of the barn. The burning building becoming too hot, I had him carried to the veranda of Garrett's house. "Booth received his death-shot in this manner. While I was taking Herold out of the barn one of the detectives went to the rear, and pulling out some protruding straw set fire to it. I had placed Sergeant Boston Corbett at a large crack in the side of the barn, and he, seeing by the igniting hay that Booth was leveling his carbine at either Herold or myself, fired, to disable him in the arm; but Booth making a sudden move, the aim erred, and the bullet struck Booth in the back of the head, about an inch below the spot where his shot had entered the head of Mr. Lincoln. Booth asked me by signs to raise his hands. I lifted them up and he gasped, 'Useless, useless!' We gave him brandy and water, but he could not swallow it. I sent to Port Royal for a physician, who could do nothing when he came, and at seven o'clock Booth breathed his last. He had on his person a diary, a large bowie knife, two pistols, a compass and a draft on Canada for 60 pounds." 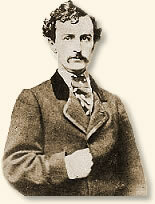 "The Death of John Wilkes Booth, 1865," EyeWitness to History, www.eyewitnesstohistory.com (1997). John T. Ford, owner of Ford's Theater, was imprisioned after the assassination but later released. The government confiscated the theater, gutted it, and turned it into a warehouse to hide its tragic history. Ford was later compensated with $100,000. Today the theater is fully restored. Dr. Mudd was sentenced to life imprisonment at Fort Jefferson on the Dry Tortugas, Florida. President Andrew Johnson pardoned him in 1867. A noted Shakespearian actor from a family of actors, Booth's last performance was with his brothers Edwin and Junius in Shakespeare's Julius Caesar in New York City in November 1864. Boston Corbett was definitely mentally unbalanced. Born in 1822, he castrated himself in the 1850s in order to better "resist sin." After the Civil war he served as a Sergeant-of-Arms to the Kansas legislature. He was committed to a mental institution after firing on a legislative session with two pistols. He escaped and vanished.